Team Sky have officially become Team Ineos to reflect their new sponsor, a chemicals firm owned by Britain's richest man Sir Jim Ratcliffe. Ratcliffe is worth £21bn and has been in talks with Team Sky principal Sir Dave Brailsford for several weeks. The new team's launch will take place at the Tour de Yorkshire on 2 May. Ineos will become the sole owners of the team from 1 May and says it "will continue to fund the current team in full, honouring all existing commitments to riders, staff and partners". BeSpoke podcast: What does this mean for the future of cycling? Ratcliffe, chairman and chief executive of Ineos, said: "Cycling is a great endurance and tactical sport that is gaining ever more popularity around the world. Brailsford, who will continue in his role as team principal, said: "Today's announcement is great news for the team, for cycling fans, and for the sport more widely. "It ends the uncertainty around the team and the speed with which it has happened represents a huge vote of confidence in our future. "In Sir Jim Ratcliffe and Ineos, I know we have found the right partner whose vision, passion and pioneering spirit can lead us to even greater success on and off the bike. It heralds the start of a hugely exciting new chapter for us all as Team Ineos." Only a year ago, the brand appeared toxic and a group of MPs accused Team Sky of "crossing the ethical line". Although that was denied, once Sky announced it was pulling out, the future looked bleak. From therapeutic use exemptions to 'jiffybags', Sir Jim Ratcliffe will have weighed up the team's various scandals in recent years, but concluded their unprecedented success is worth being associated with. This will come as a huge relief to the team's staff and fans who will be delighted that their star riders will now stay. Others, however, will be concerned that the dominance of cycling's wealthiest team could continue, making races too predictable. I understand the team's annual £35m budget will be maintained and perhaps even increased. Joining forces with Ratcliffe allows the team to preserve their British identity, although some will point out reports of the billionaire's controversial recent move to tax haven Monaco. Environmentalists will also be concerned that Ineos - one of the biggest plastic producers in Europe, with an interest in fracking in the UK - could be investing in the green sport of cycling as a PR tactic. What does it mean for Sky's riders? Ineos' takeover secures the immediate futures of Brailsford and Team Sky's riders with contracts beyond the end of this season. Four-time Tour de France winner Froome's deal runs until the end of 2020, while Thomas is under contract until 2021. This takeover also ensures the team will retain highly rated Colombian Egan Bernal, who signed a notable five-year deal in October. 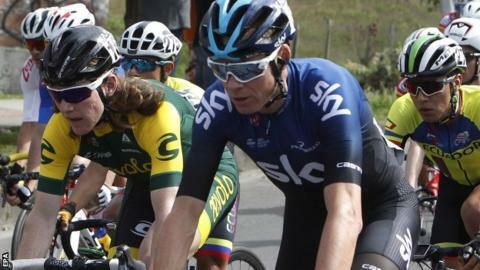 The 22-year-old won Paris-Nice on Sunday, will lead Team Sky at this year's Giro d'Italia and is expected to challenge for Grand Tour titles throughout his career. Ivan Sosa, another promising young Colombian, signed a three-year deal last year and Brailsford reportedly met the Colombian government and the country's largest petroleum company Ecopetrol while searching for new sponsorship. But Ineos' investment means the team remains backed by a UK company, with eight British riders in Team Sky's 29-man roster. Team Sky's accounts for 2017 revealed a budget of £34.5m, the biggest in professional cycling. Ineos is one of the world's largest manufacturers of chemicals and Britain's largest privately owned company. Ratcliffe announced £1bn worth of investments in the UK oil and chemical industries last month. Ineos moved its head office to the Swiss city of Lausanne in 2010 to cut its corporation tax bill, but returned to the UK in 2016, with headquarters in London and an office in Hampshire. The company has rights to explore for shale gas in sites in Cheshire, Yorkshire and the Midlands, but has yet to start fracking because of planning disputes, with Ratcliffe criticising the government's fracking rules. Ratcliffe, 66, was born in Failsworth, near Manchester, and worked as a chemical engineer before founding Ineos in 1998 out of previous company Inspec. He retains a 60% stake in Ineos and was knighted in June last year, shortly after becoming the first British-born industrialist to top the Rich List. Ratcliffe supports Brexit and last month criticised the European Union, saying its "foolish" green taxes deterred investment in industry. He is a season ticket holder at Chelsea and was linked with a £2bn bid to buy the club from the Stamford Bridge club's owner Roman Abramovich. In 2017, he bought football club FC Lausanne-Sport, who play in the Swiss second tier.